Anyone who knows me well knows I LOVE Pinterest!! It's basically my favorite internet pastime. It has something for everyone. Even my husband, who loathes Facebook and the like, enjoys the humor boards and DIY building stuff pins. Well, I saw this on Pinterest last year and thought it was just the cutest Easter themed food and I had to make it. 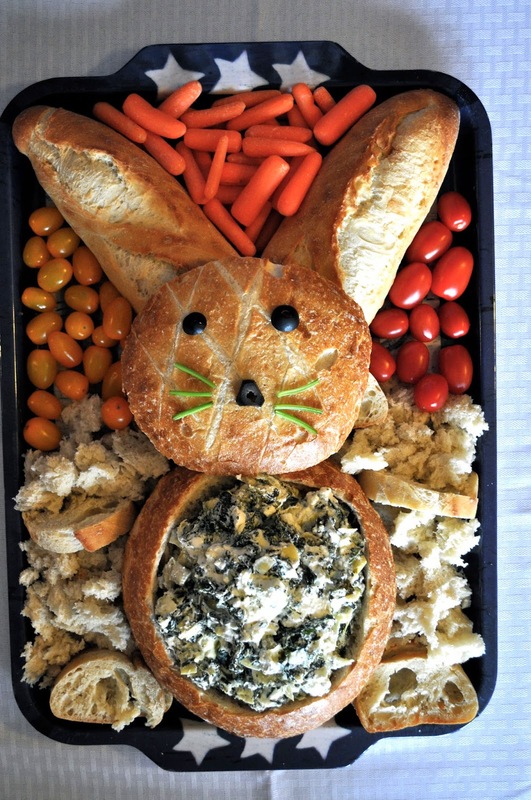 If you are looking for a cute addition to your Easter table, try out this Easter bunny bread filled with Spinach Artichoke dip and surrounded by cut veggies. You can use the veggies or the bread for dipping. Both taste great! Happy Easter! 1. Cut off the top circle of the round loaf carefully to make the bunny's face. Hollow out the body by ripping pieces from the inside of the round loaf to set aside for dipping, as well as, make room for the dip. 2. Cut the ends of the baguette off for the bunny's ears and place on tray above the round bread/bunny's head. Rip/slice the leftover middle section of the baguette and add to other bread pieces for dipping. 3. Slice an olive in half for bunny's eyes and quarter an olive for a piece to use as the center of the nose. Thinly slice a small piece of celery for the whiskers. Arrange bunny's face on the round top piece of bread. 4. 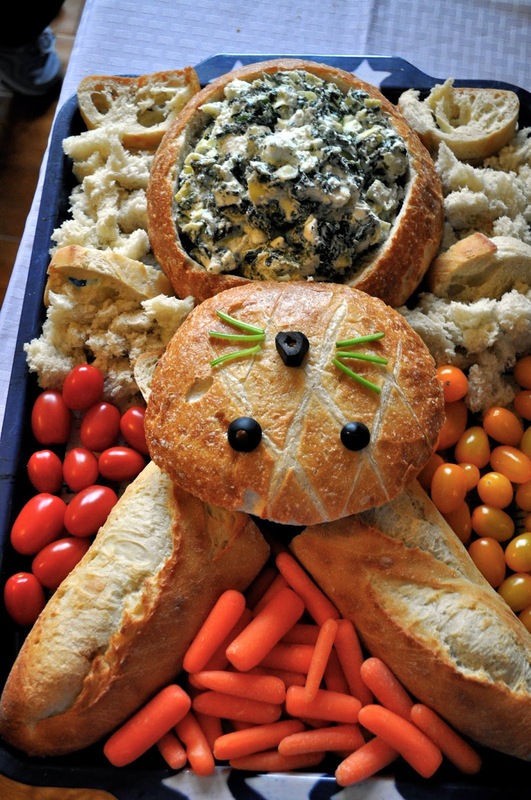 Fill the bunny's body with dip and fill on the empty areas on the platter with veggies and bread pieces.